The following provides a brief outline of the roots of Japanese martial arts. Sensei Ros Loft had known Fujimori Akira prior to his regular visits as part of her regular training. By 2003 Fujimori Akira had become the clubs patron and was making regular bi-annual visits to Luton. During these visits he would give daily lessons and training sessions at the club lasting several hours, as well as out of hours training and teaching. During free periods the club would take him out to various tourist attractions as he had a keen interest in history. Sensei Fujimori recently came to England on a friendship visit to Luton Aikido Club. While visisting he held a 2 day seminar at Lea Manor Recreation center which was featured in the local paper the Luton News. The article was written by Ron Loft, husband of Sensei Ros Loft and reporter and has been reproduced below courtesy of the Luton News photographs by Gareth Owen. One of Japan's most distinguished martial arts experts is spending nearly three weeks in Luton to pass on some of his skills to local students of Aikido. Akira Fujimori, known in martial arts circles as Fujimori Sensei, has come to the town to link up with Luton Aikido Club. 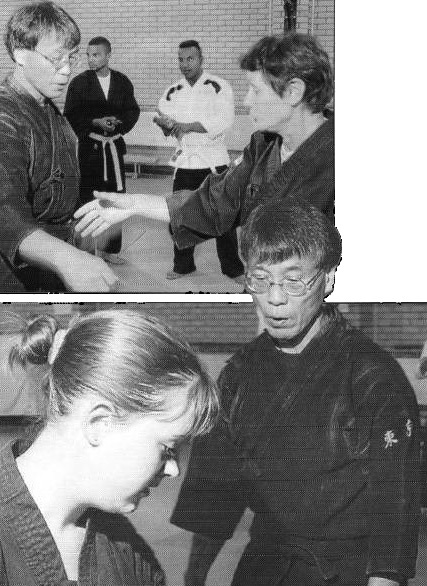 The club was founded 26 years ago by Ros Loft, who is still it's chief instructor.She met Fujimori Sensei some years ago when he was making one of his rare visits to Europe. The two have kept in touch ever since, and Fujimori Sensei offered to act as guest instructor at a series of intensive training sessions at the Holy Trinity church hall in Trinity Road, where the club meets. He also held a two-day Aikido teaching seminar at the Lea Manor Recreation Center, Marsh Farm. Aikido students from other clubs around Britain were invited to the seminar. Said Mrs Loft: "Sensei Fujimori's visit is a tremendous honour for the Luton Aikido Club and the town. He is someone who is greatly respected among martial artists". Fujimori Sensei is a 7th Dan Black belt in aikido, and holds high grades in other martial arts. He is a graduate of Tokyo University, and has taught at the university's martial arts club. For Mrs Loft there was a surprise in store. Fujimori Sensei presented her with a personal seal that he had designed specially for her. 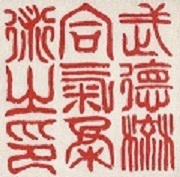 A personal seal has an important place in the culture of Japan, and few Westerners have one. Mrs Loft added: "I would like to thank the Council's leisure staff, including those at Lea Manor, for making the seminar such a success". Fujimori Sensei, one of Japan's most expert martial arts exponents, has visited the Luton Aikido Club for a second time after first coming to Luton in 2003. He arrived at Heathrow Airport very early one sunny morning and was met by a bleary eyed trio - Sensei Loft, who founded the Luton club, Darren Murphy and Yasushi Ihara, who was one of Fujimori Sensei's students some years ago. The club was greatly honoured by the visit from such a distinguished martial artist, who studied with the legendary Morihei Uyeshiba the founder of modern-day Aikido. Fujimori Sensei, who is a 7th Dan Black Belt in Aikido, has now been permitted and authorised (by his teacher Tanaka Shihego) to start his own style called (Tanaka Ha) Butokuryu Aiki Jujutsu. During his stay in Luton he held daily teaching sessions at the Luton Aikido Club, passing on to the club members some of his very considerable knowledge of the martial art, which he has practised for decades. The club members owe a great debt to Fujimori Sensei for travelling thousands of miles to help improve their Aikido skills. The teaching sessions were a great success. The club also thanks to Yasushi for travelling down from Durham to train and translate from Japanese to English, and to Darren, who helped in so many ways. During the times he was not teaching at the club the distinguished visitor took in many of the local places of interest in the Beds, Herts and Bucks area. These included Bletchley Park (Station X), where the Enigma codes were broken, and Aldbury, a typical english village located two miles from Tring which has been used for many film and television programmes including episodes of Inspector Morse. Sensei Fujimori arrived back in the UK on a very grey and wet Monday 13 May 2007 to be greeted by Sensei Loft and Darren Murphy. This time however, he was met by Sensei Brett Nener from the University of Western Australia (Perth) Aikido Club. After a slightly longer and more scenic route courtesy of road works, we arrived back in Luton. During the 3 short days Sensei Nener was in the UK he translated Sensei Fujimoris teachings. During his short stay Sensei Nener also translated some of Sensei Fujimoris forthcoming book which has been likened to Miyamoto Musashis The Book of Five Rings. In between training sessions, Sensei Fujimori and Nener visited Stratford-upon-Avon for a some sight seeing and relaxation time taking in lunch at one of local timber framed pubs. On the Thursday morning Sensei Nener had to leave Luton for a conference in Italy and seemed to take the rain with him. On Friday we were joined by Yukiko, (closely followed by sunshine), the daughter of Sensei Fujimori's friend Uehara-san. Currently Sensei Fujimori teaches Aikido to Yukiko's sister Akiko in Oita. After Yukikos arrival we enjoyed a nice dish of Fajitas cooked up by the guest chef Darren in the garden. The lesson that evening continued despite the best efforts of the dojo hall door lock but this was remidied after the lock was given an attitude adjustment by Darren and his size 9 boots(with permision from the parish priest I might add). After training on Saturday we were invited to an evening of traditional Polish musich, dance and food held at the Polish Club in Dunstable courtesty of Eva, one of the club members. We all had a wonderful time and made fools of ourselves when we were dragged up to join in with one of the dances. Sunday was the last training session held in the Dojo after which, Yukiko returned back to University along with the sunshine. On Monday morning James and Karen took Sensei Fujimori, Ros and myself to visit Hatfield house, unfortunately the main house was closed but we had a nice time walking round the Tudor style gardens. Luckily the rain stopped and by early evening the garden at Sensei Lofts house was dry enough to put mats down to train. We trained until it was dark in the nice fresh air, it was very relaxing. Tuesday evening we also trained in the garden until dark. On the wednesday morning Sensei Loft, Tomoko and Darren journeyed to Heathrow airport to see Sensei Fujimori off on his long flight back to Japan. September 4th - 13th September. Sensei Fujimori arrived on the 4 September 2009 and was greeted by Sensei Loft and Darren Murphy. After a slightly longer return journey courtesy of the roadworks on the M25, we arrived back in sunny Luton. There were nine days of training at the club and several seperate sessions in the Sensei Loft's garden. Several of us then took Sensei Fujimori for a visit to Windsor Castle which Sensei seemed to enjoy. Luckily we timed the visit as the guard was being changed (more by luck than judgement) and Sensei seemed especially taken with St Georges Chapel, in particular the stalls containing the Orders of the Garter. Darren later took Sensei Fujimori on a longer visit to Lincoln and the Catherdral. Darren Murphy came over especially to help out Sensei Loft and met and collected Sensei Fujimori from the airport. The club owes a big debt of thanks to all the hard work Darren has put in over the years to help out and to look after Sensei Fujimori on his visits. There were eight days training at the club and several seperate sessions in the Sensei Loft's garden. Visits to Winchester, Luton Museum, Milton Keynes Museum, Woburn, Tring and the nearby Pitstone windmill where we went for a walk. It was a late summer afternoon, warm and sunny and there were Skylarks in the feilds and everyone seemed very relaxed. Sensei Loft also held a party in her garden in the evening and everyone got quite merry. Sensei Loft then amused herself by lighting a chimenia, creating clouds of smoke that periodically enveloped everyone and cackling whilst we all choked. On the 5th September Darren drove Sensei Fujimori back to Heathrow for his return flght. Sensei Loft, Demetrius and Darren saw him off. It is with regret I must announce that Sensei Akira Fujimori the club patron passed away at his home in Oita, Japan around midnight on Saturday 17th November 2012. The funeral was held Tuesday 20th November 2012 with his Wife's family, Sensei Fujimori's brothers and some close family friends.